After picking up two trophies in the previous season, the Star began what would turn out to be a run of ten years without silverware. The Star once again progressed through the group stages of the League Cup, although did suffer a defeat at Dalkeith Thistle, a team that would have ignominy of finishing the season bottom of the Second Division. In the quarter-final, the Star met Camelon, the team they had beaten in the final the previous year. The Star lost 1-0 to relinquish their hold on the trophy Strangely, in the East of Scotland Cup, the Star also faced the team they had beaten in the final the previous year, Bo'ness United, and once again lost going down 3-1. In the Scottish Junior Cup the Star had a good run. After accounting for Lanark United, Ormiston Primrose and Port Glasgow in earlier rounds, the team met Dundee St. Josephs at home in the fifth round, a team that had spent quite a bit of money in the pursuit of success. After falling two goals behind, the Star fought back to secure an unlikely replay with two late goals from Jason Cockburn and David Scott, a player who had returned to the club after a 12 year absence. The replay though was far from enjoyable for those Star Supporters who journeyed north as the home side grabbed five goals without reply. The league campaign resulted in an unspectacular mid-table finish due to a mixed bag of results. The 4-0 win at Arniston Rangers with goals from Craig Cunningham (2), David Buchan and Ray Sinclair was probably the best. The Star also defeated Bonnyrigg Rose 2-1 in the league at New Dundas Park with goals from Graham Little and Jason Cockburn, but trouble was to follow the match report that appeared in the Star's next programme. Describing a challenge on the Star goalkeeper, the report suggested: 'The Bonnyrigg prop forward bit off Stewart's left ear, gouged out both his eyes, shot him in the stomach with a revolver and cut off his head with a machete. The ref failed to spot the infringement.' Newtongrange Star were soon facing possible legal action for the comments and the ire of ERSJFA. Armadale Thistle H 1 0 Cunningham Stewart, Affleck, Sheridan, Fraser, Robertson, O'Hara, Cockburn, Cunningham, Scott, Little, MacNamara. Subs: Buchan, Sinclair, Dall, McQueen. Arniston Rangers H 0 1 Stewart, Hughes, Fraser, MacNamara, Aitchison, O'Hara, Curran, Cockburn, Scott, Little, Graham. Subs: Buchan, Garner, Sheridan, Perry, Johnston. A 4 0 Cunningham 2, Buchan, Sinclair McQueen, Sinclair, Fraser, Robertson, Aitchison, O'Hara, MacNamara, Buchan, Cockburn, Cunningham, Hughes. Subs: Sheridan, Johnston, Stewart. Bo'ness United H 2 1 MacNamara, Scott Stewart, Affleck, Fraser, Garner, Aitchison, O'Hara, MacNamara, Cunningham, Scott, Little, Buchan. Subs: Cockburn, Sinclair, Hughes, McQueen. A 0 0 McQueen, Sheridan, Fraser, Garner, Aitchison, O'Hara, Cockburn, MacNamara, Scott, Little, Buchan. Subs: Bailey, Hughes, Cunningham, Perry, Stewart. Bonnybridge Juniors H 1 1 O'Hara McQueen, Affleck, Fraser, Garner, Aitchison, O'Hara, Buchan, MacNamara, Scott, Little, Graham. Subs: Stewart, Hughes, Bailey, Cockburn, Perry. Bonnyrigg Rose H 3 0 Scott 2, Little McQueen, Sinclair, Sheridan, Fraser, Aitchison, O'Hara, MacNamara, Cunningham, Scott, Little, Buchan. Subs: Cockburn, Johnston, Dall, Perry, Stewart. A 2 1 Little, Cockburn Stewart, Hughes, Fraser, Garner, Sheridan, MacNamara, Buchan, Graham, Scott, Little, Cockburn. Subs: Perry, Affleck, Cunningham, Curran, McQueen. Camelon Juniors H 1 1 ? McQueen, McNamara, Perry, Garner, Sheridan, O'Hara, Hughes, Cockburn, Scott, Little, Cunningham. Subs: Bailey, Stewart. A 3 1 Buchan, Graham, Curran McQueen, Affleck, Fraser, Garner, Sheridan, O'Hara, MacNamara, Curran, Scott, Cunningham, Graham. Subs: Perry, Little, Buchan, Hughes. Fauldhouse United H 1 0 Scott Stewart, Hughes, Fraser, Garner, Sheridan, O'Hara, Cockburn, Graham, Scott, Little, MacNamara. Subs: Johnston, Buchan, Curran, McQueen. A 0 2 McQueen, Affleck, Fraser, Garner, Hughes, MacNamara, Sheridan, Buchan, Scott, Curran, Graham. Subs: Little, Cockburn, Aitchison, Bailey, Stewart. Linlithgow Rose H 0 0 McQueen, MacNamara, Fraser, Robertson, Aitchison, O'Hara, Perry, Cunningham, Cockburn, Little, Buchan. Subs: Johnston, Hughes, Dall, Sinclair, Stewart. A 1 2 Scott McQueen, Cockburn, Garner, Sheridan, MacNamara, O'Hara, Hughes, Buchan, Scott, Bailey, Little. Subs: Cunningham, Curran, Perry, Stewart. Musselburgh Athletic H 3 1 Scott 2, Little Stewart, Sinclair, Sheridan, Fraser, Aitchison, O'Hara, MacNamara, Cunningham, Scott, Little, Buchan. Subs: Cockburn, Johnston, Affleck, Dall, Robertson. A 2 2 Hughes, Cockburn Stewart, Affleck, Fraser, Garner, Aitchison, MacNamara, Hughes, Buchan, Scott, Cockburn, Graham. Subs: McQueen, Little, Sheridan, Curran, Johnston. Tranent Juniors H 4 1 Scott 2, O'Hara 2 Stewart, Hughes, Sheridan, Garner, Aitchison, O'Hara, Cockburn, Graham, Scott, Little, MacNamara. Subs: McQueen, Buchan, Curran, Cunningham, Affleck. A 5 3 Cunningham, Little 2, Garner, O'Hara Stewart, Affleck, Fraser, Garner, Johnston, O'Hara, MacNamara, Buchan, Scott, Little, Cunningham. Subs: McQueen, Cockburn, Sinclair, Hughes. Whitburn Juniors H 1 1 Scott McQueen, MacNamara, Graham, Garner, Aitchison, O'Hara, Curran, Cockburn, Scott, Little, Buchan. Subs: Trialist, Bailey, Hughes, Perry, Stewart. 2 H Ormiston Primrose 2 2 Cunningham, Scott McQueen, Affleck, Fraser, Robertson, Aitchison, O'Hara, MacNamara, Cunningham, Scott, Little, Buchan. Subs: Cockburn, Sheridan, Dall. 3 A Port Glasgow Juniors 4 1 Cunningham, Scott 2, Little Stewart, Affleck, Fraser, Robertson, Aitchison, O'Hara, Cunningham, Sheridan, Scott, Little, MacNamara. Subs: Buchan, Cockburn, Hughes, Perry, McQueen. 4 H Dundee St. Josephs 2 2 Cockburn, Scott Stewart, Affleck, Fraser, Garner, Aitchison, O'Hara, Buchan, MacNamara, Scott, Little, Cunningham. Subs: Johnston, Hughes, Sheridan, Cockburn, McQueen. 2 H Haddington Athletic 1 2 Cockburn McQueen, MacNamara, Fraser, Robertson, Aitchison, O'Hara, Cunningham, Dall, Cockburn, Little, Hughes. Subs: Sheridan, Sinclair, Garner, Stewart. 1 A Bo'ness United 1 3 Little McQueen, Sinclair, Johnston, Fraser, Aitchison, O'Hara, Perry, MacNamara, Cunningham, Little, Cockburn. Subs: Buchan, Dall, Affleck, Sheridan, Stewart. 2 H Haddington Athletic 3 3 5 4 Buchan, Bailey, Little McQueen, Affleck, Fraser, Garner, Sheridan, O'Hara, Buchan, Curran, Scott, Graham, MacNamara. Subs: Little, Bailey, Aitchison, Cockburn. QF H Linlithgow Rose 1 4 Scott McQueen, Sheridan, Fraser, Garner, Aitchison, O'Hara, Cockburn, Little, Scott, Bailey, MacNamara. Subs: Hughes, Curran, Buchan, Cunningham, Stewart. 1 A Bonnyrigg Rose 1 0 Buchan Stewart, Affleck, Fraser, Garner, Aitchison, O'Hara, MacNamara, Buchan, Scott, Little, Cunnningham. Subs: Hughes, Cockburn, Perry, Johnston, McQueen. 2 H Bonnybridge Juniors 0 1 McQueen, Affleck, Fraser, Garner, Aitchison, O'Hara, McNamara, Cunningham, Scott, Little, Graham. Subs: Hughes, Sheridan, Curran, Cockburn, Stewart. Arniston Rangers H 2 0 Bailey, Cockburn McQueen, Aitchison, O'Hara, Robertson, E. Archibald, MacNamara, Cockburn, Hughes, Little, Cunningham, A. Archibald. Subs: Johnston, Bailey, Dall, Perry. A 3 2 Cunningham 2, A. Archibald McQueen, MacNamara, Fraser, Robertson, E. Archibald, Hughes, Perry, Buchan, Cunningham, Bailey, A. Archibald. Subs: Dall, Johnston, Sinclair, Cockburn. Dalkeith Thistle H 5 4 Cunningham, MacNamara, Little, A. Archibald, Buchan McQueen, Aitchison, Fraser, Robertson, E. Archibald, Hughes, Cunningham, MacNamara, Little, Bailey, A. Archibald. Subs: Johnston, Buchan, Sinclair, Dall, Perry. 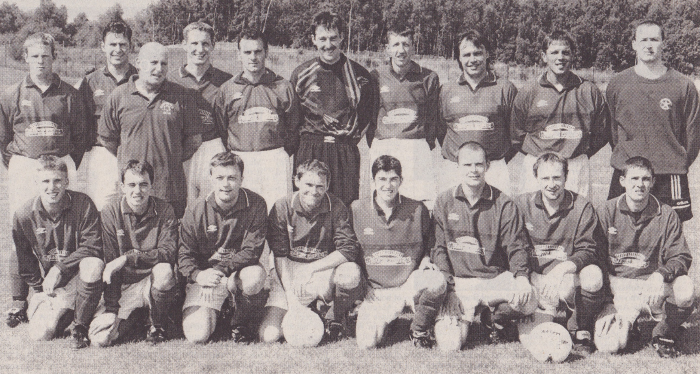 QF H Camelon Juniors 0 1 McQueen, MacNamara, Fraser, Robertson, Aitchison, O'Hara, Perry, Cockburn, Little, Bailey, Hughes. Subs: Johnston, Cunningham, Sinclair, Affleck, Stewart.